"The first victim of these attacks are our customers, forced to pay the damage in terms of quality of service, said Joseph Biesuz, CEO of Trenord. Each year the vandalism subtract about 12 million euros to regional rail service, the equivalent of a train six new double-deck coaches from more than 1000 people. It is a matter of unspeakable savagery that recalls all of our sense of social responsibility. We can not stand idly by. " In the last year have been removed around 395 thousand square meters of graffiti from the sides of trains, an area equal to 23 times that of the Piazza del Duomo in Milan. To clean them, have served 66 thousand hours of work, like say 2750 days, equivalent to seven and a half years. 1000 broken windows have been replaced or rendered unusable for incisions or graffiti, equal to the same surface characteristics of an Olympic swimming pool. It has taken 54 thousand square meters of cloth to cover the 36 thousand new seats crumpled, stained or otherwise rendered unusable. The remake of the seats were vandalized took more than 5 thousand hours of work. have been stolen and restored 8600 breakers hammers glass and 250 fire extinguishers. They have been replaced or developed 61mila tendon. 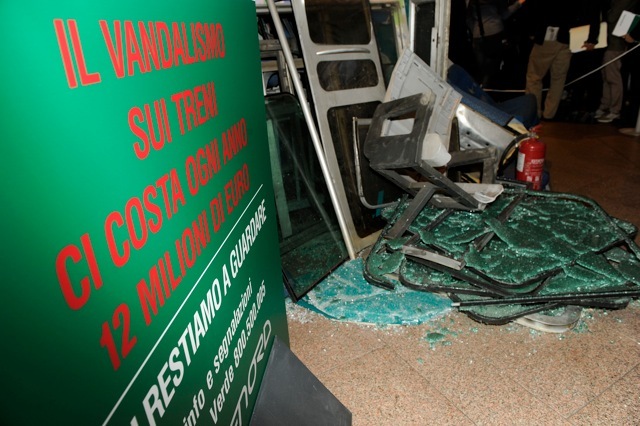 On average trains Trenord undergo two vandal attacks per day, with peaks of 5/6 on the weekend, at least once a day happens the damage is such that a train should be removed from service for repair work means 8250 hours subtracted commuter train service and forced to stop in the store for repair of vandalism damage. Only this item is worth just under 4 million per year. Surprise installation of vandalised train parts in Cadorna Station, Milan.